My wedding is a mere 6 weeks away. And with my final dress fitting just around the corner I’m focused on not gaining—or losing—any weight. I’m on track weight-wise (now, if my arms could just look like Michelle Obama’s…), but lately my sweet tooth has been getting the better of me. So to satisfy my dessert cravings, but not go overboard, I’ve been whipping up some of these low-calorie dessert recipes—that way I only have to cut back a little bit at one of my other meals. If you’re like me and trying to maintain your weight—or maybe even drop a few pounds—don’t feel like you need to banish dessert altogether. Indulge guiltlessly with these 100-calorie (or less!) desserts. 1. 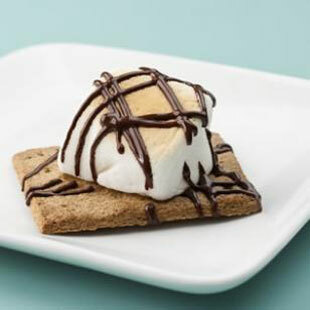 Indoor S’Mores: No fire required here! This delicious dessert takes 5 minutes, or less, to whip up. Delish! 2. Almond & Honey-Butter Cookies: When they were testing these in the EatingWell Test Kitchen I couldn’t stay away! This thumbprint cookie uses honey as the only sweetener and tender ground almonds to replace much of the butter found in similar cookies. 4. Boot Tracks: This quick, no-fuss, chewy chocolate cookie is made on your waffle iron. Making it even easier, there’s no need to haul out the big mixer: you can mix the batter with a small hand mixer or even by hand. 5. Vanilla-Orange Freezer Pops: These creamy vanilla-flavored orange juice pops transport me back to the days of standing in line at the ice cream truck. 6. Chocolate & Nut Butter Bites: Another sweet satisfaction ready in seconds! I like to keep these ingredients on hand at the office.